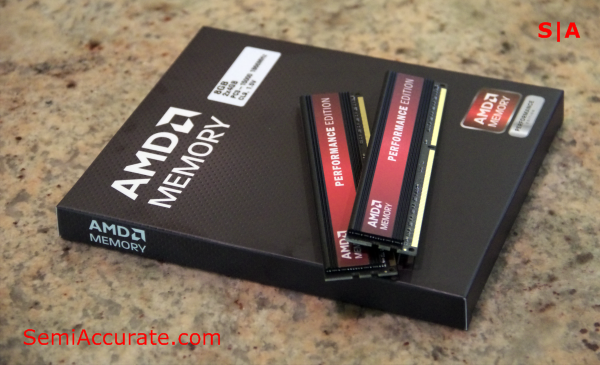 Near the end of last year AMD began a foray into the desktop memory business. At the time AMD’s entry into this market was met with a mixed reaction. Due to the bundling of GPUs and memory that’s common in the discrete GPU business, AMD had all ready been a large memory re-seller. And with the memory bandwidth dependence of its APU products, there was more reason than ever for AMD to enter the desktop memory market and provide high speed solutions. Despite this AMD got off to a bit of a slow start, and AMD memory hasn’t really been in the news since it launched. Here we have a specimen that AMD was kind enough to provide us with. 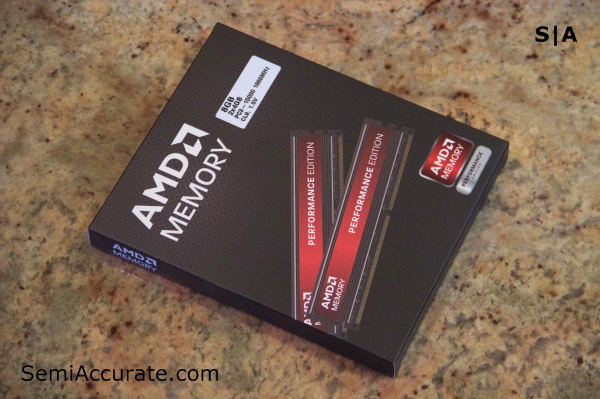 As you can see AMD’s marketeers have made ample use of red, white, and black on the packing for this memory kit. The back of the box here has a nice little parable on the quality of this RAM. 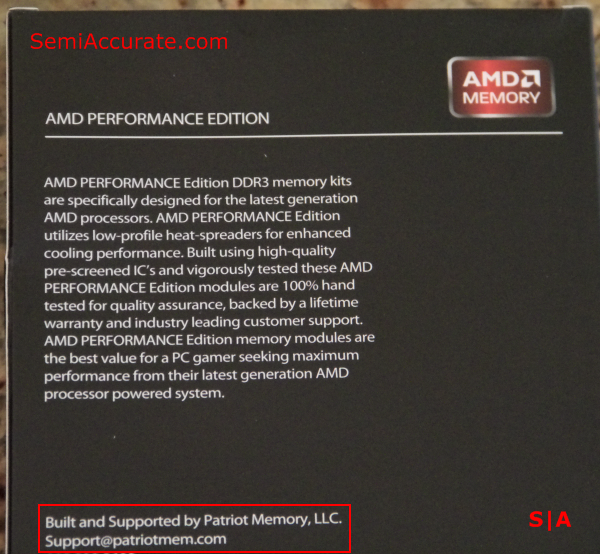 But most importantly it points out what AMD branded memory really is, re-badged DIMMs from Patriot. Granted that’s not necessarily a bad thing. Patriot has been in the memory business for some time and has built up a positive reputation to some degree. At the end of the day AMD’s memory brand has a competent package and color scheme, even if it’s just another brand of Patriot memory. On a more interesting note AMD is introducing what it calls AMP technology with these modules. 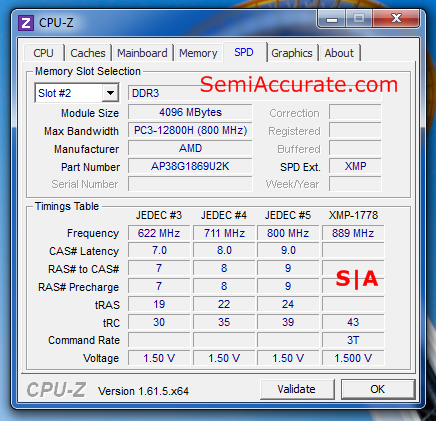 For some time now the memory makers have been selling RAM with Intel optimized memory profiles under the banner of XMP, or eXterme Memory Profiles. Up to this point AMD has had no response, and an article on Tom’s Hardware back in June crystallized this deficiency for all to see. But now things are changing with the introduction of AMD Memory Profiles. At the risk of coming off as a total tease, our testing of AMD’s AMP profile is going to have to wait for another day. But we can say that the AMP profile increases memory speed from 1600Mhz all the way up to 1866Mhz for free, which is quite a value proposition. 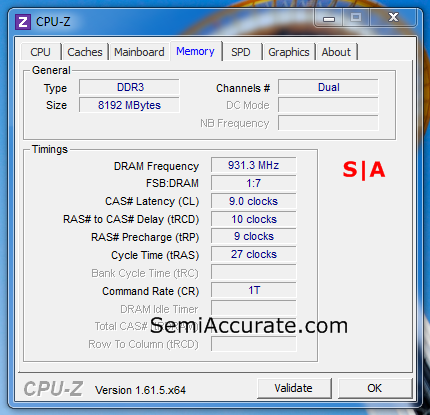 With this RAM installed on a Core i7-3770K system with Intel’s DZ77GA-70K motherboard it ran at 1.5 Volts by 800Mhz meeting it’s rated DDR3 1600 specification. Were we able to select the XMP profile in the BIOS, but for whatever reason speeds would revert to 800Mhz when we hit Windows. A short overclocking experiment with this RAM was far more successful than our XMP experience. At 1.5 Volts and DDR3 1866 speeds this RAM was just barely unstable. A one hour Prime95 stress test produced but a single error. Bumping the Voltage up to 1.55 Volts resulted in rock solid stability in an hour long stress test.